Ingredients: Egg yolk powder, taurine, iodized salt, vitamin E, iron amino acid chelate, copper citrate, manganese amino acid chelate, zinc oxide, vitamin D3, vitamin B12, vitamin B1. 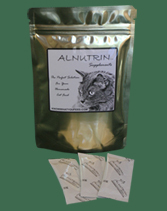 Alnutrin for Meat & Bone is designed for diets with bones. 1/4 cup (or 60 g) of water, can be adjusted as needed. Are you wondering where to get the meat? Go to Links to find addresses for major US raw meat suppliers.